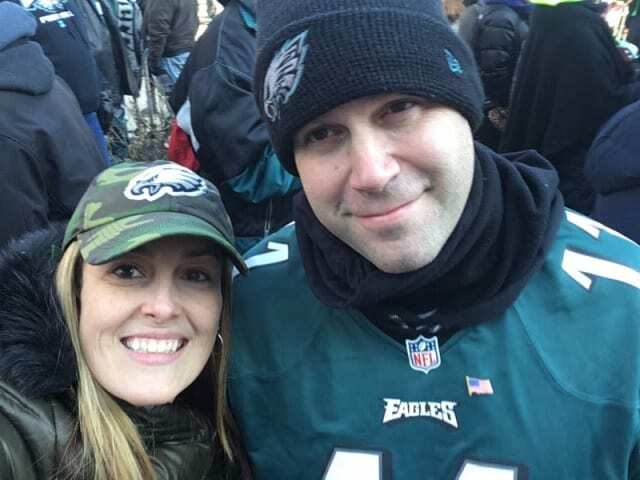 OK, Patriots fans, things didn't go our way, but local Eagles fans are having fun. Elizabeth and Jason Burns enjoy Thursday parade with selfie. 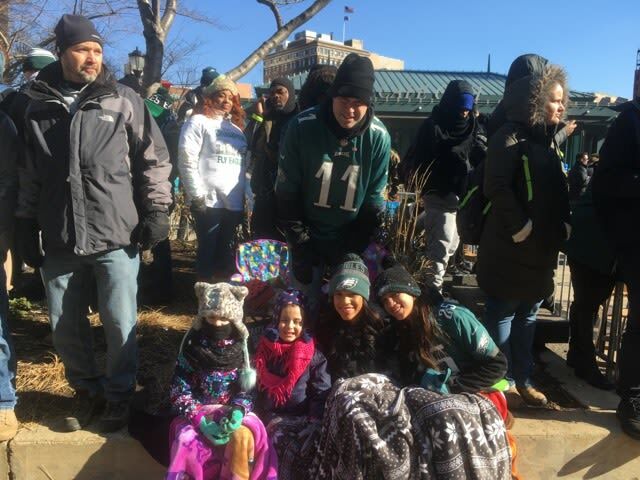 Jason Burns with his four daughters join crowd, from left, Samantha, 6; Abby, 5; Taylor, 21, and Madison, 15. 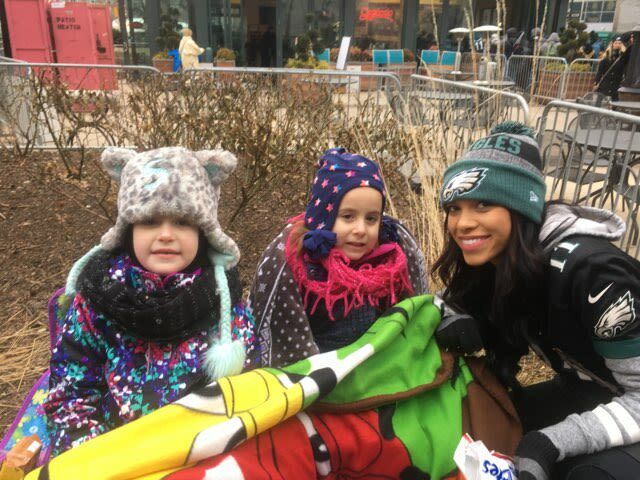 It was cold but that didn't stop three of the Burns' daughters, Samantha, Abby and Taylor. Brought the entire family. Left Fall River Wednesday night in got into Philly at 1am. I woke up at 5 and got the family up to begin getting ready to find a location. We stayed a shade over 2 miles away from the Benjamin Franklin Pkwy. We walked to the beginning of the pkwy which leads up to the Art museum. It was about an hr walk. Freezing cold day, very tough to keep everyone warm, a lot of hurrying around to only sit and wait for a looong time. We probably got to our location by 8am and the parade didn't make it thru until 1pm. Jumbo trons were set up around the pkwy and they replayed the super bowl from like 8am to 11am...then they just started pumping music in massive speakers which were laid out throughout the parade route. People were just overjoyed all day...good behavior...everyone just smiling and getting along...truly was brotherly love. Some people brought ashes from family members remains and sprinkled at the parade route cuz a loved one passed and never saw a super bowl. By 1 when they were coming by us we were so ready...everyone was amped up...there was the Vince Lombardi trophy riding thru the streets of Philadelphia for the first time ever...truly a once in a lifetime experience....so fun...most people just screaming, doing Eagles chants or simply yelling thank you...just thank you...it meant so much to all of us what they accomplished. And boom just like that they passed thru...took I'm guessing 10 minutes and then it was over for us. We couldn't get close enough to the stage where the players spoke...and they still had another 45 mins to get there. Girls were ice cubes and starving so we hit the road. 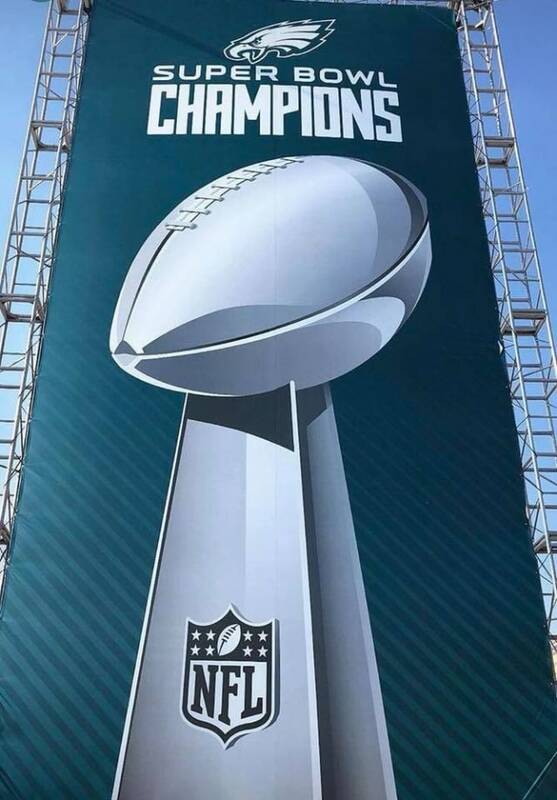 We're glad Eagles fans had their fun. But they've still got some catching up to do.